Northern Kentucky University (NKU) is located in the suburbs of Highland Heights, Ky., across the Ohio River and a mere seven miles southeast of downtown Cincinnati. In recent years, the university has experienced both huge growth in its college of informatics programs and a surge in demand for health care professionals. These changes are shaping the next phase of facilities space requirements for NKU and its 14,000-plus students. In April 2014, the state approved $97 million for the university’s Health Innovation Center (HIC)/Founders Hall renovation project, which opened its doors in fall 2018. It so happened that when the HIC capital funding proposal was developed, the university also needed to fully renovate its landmark Founders Hall, a five-story former science building that was partially vacant. The university conceived the HIC as an addition to Founders Hall, shifting about 40,000 square feet of the planned renovation into the landmark building. 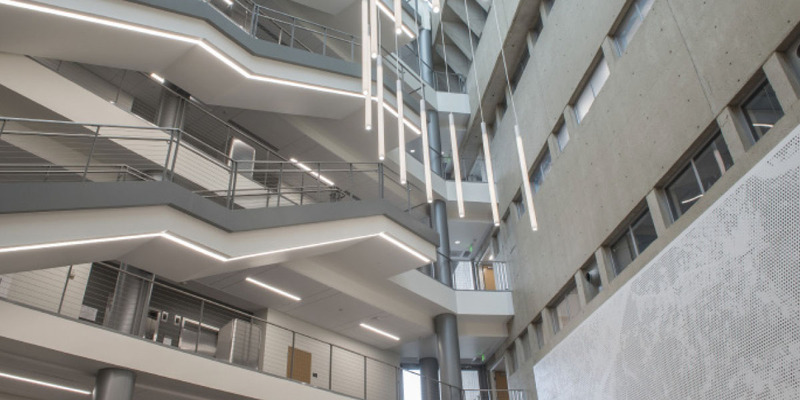 This strategy achieved a net savings of about $20 million compared to the cost of two separate projects, says Mary Paula Schuh, NKU’s director of campus and space planning. “While we are a relatively young campus, it is still important to us not to lose our heritage,” adds Mark Jones, university architect. Today, visitors to the old-meets-new space enjoy a vaulted, five-story atrium that connects the two buildings. The juxtaposition between the original facade of Founders Hall and the new center has become a symbol of the past meeting the future, says Jones. To accomplish its reincarnation, Founders Hall was essentially gutted to its structural frame. Because all interior walls are new, this allowed for greater flexibility in designing the space. The blank slate also made it easier to address antiquated HVAC systems and bring the building up to full energy efficiency standards, notes Jones. The new center houses mostly simulation and collaboration spaces, with classrooms, research labs, student project rooms, and offices primarily located in Founders Hall. While the total number of classrooms decreased from 27 to 20, all new classrooms accommodate active learning concepts and technologies. “This also represents a rebalancing of space priorities, since what we really needed was more lab space,” says Schuh. The renovation also impacted office space. “For the past 15 years, our standard faculty office was about 125 square feet. We have trimmed that to 110 square feet on average, while striving to bring in as much natural light and transom light as possible,” says Schuh. The renovation also added 15 “hoteling” stations ringed by permanent offices, informal huddle spaces, and formal meeting spaces. The fact that many faculty members today can work on most any device from anywhere—including from home—necessitates rethinking whether to devote so many square feet to spaces that can often sit empty throughout much of the day, notes Schuh. The blending of the new HIC and renovated Founders Hall also provided an opportunity to combine and co-locate all health sciences and health research in one complex. The university is also integrating interdisciplinary and transdisciplinary learning opportunities into the center, creating a resource for all students, not only those who are enrolled in the health-related disciplines, says Schuh. As one example, a studio in the new complex was designed not only to host dance classes, but also to be used as a kinesiology research space and a place to teach movement therapy. Several labs within the new center are available for scheduling by any department across campus. Planning efforts for the new center were anchored in close partnerships with the community, including with St. Elizabeth Healthcare, the largest system provider in northern Kentucky, which donated $8 million at the beginning of the project toward inclusion of high-tech simulation lab space. This partnership is just one of the significant strides NKU has made toward its goal of becoming a regional leader in addressing health and wellness challenges, such as diabetes, opioid addiction, and homelessness. In addition, the University of Kentucky College of Medicine recently partnered with NKU to develop a regional campus as part of a strategic effort to boost the number of primary care physicians in Kentucky. The inaugural class of 35 UK College of Medicine—Northern Kentucky Campus medical students will arrive at NKU in fall 2019. Space previously housing the university’s nursing department is receiving minor renovations to accommodate the medical students. “We’ve also spent the past year reassessing our housing strategy,” says Michael Hales, NKU’s chief financial officer. Currently, the university owns slightly more than 2,000 beds. While NKU began as a commuter campus, and now also has a burgeoning online presence, over time the university has gradually been adding residential options for students while trying to be sensitive to overbuilding. Two opportunities on the outskirts of campus allowed NKU to avoid investing the substantial time and financial resources typically required for new construction, says Schuh. In 2007, the university purchased a former county-owned nursing home. Within 12 months, NKU opened a fully converted residence hall with a dining venue for 400-plus students. This was followed in 2013 with the purchase of a nearby county-owned senior independent living facility that the university reconfigured into suite-style living units that can house another 200 students. During its gut renovation, Founders Hall was taken offline for 18 months. NKU’s flex-space strategy over the years has included sharing space across departments and thinking creatively about space resources, including the purchase of houses around the periphery of campus that have been used for offices and other university support functions. No longer needed for swing spaces, these resources have become part of the menu of housing options to rent to faculty, staff, or graduate students, notes Hales. NKU is currently in the process of emptying several other buildings it purchased that border the campus. Options for these spaces include leasing space to the university’s foundation and to incubator startups. By thinking strategically about renovations, partnerships, and neighborhood resources, NKU has created opportunities for enriching the campus and its students and staff, while also strengthening its connection to the community, now and into the future. SUBMITTED BY Karla Hignite, Fort Walton Beach, Fla., who is a contributing editor for Business Officer. All new classrooms accommodate active learning concepts and technologies. Send to editor@nacubo.org a brief description of a project, process, or plan that’s working on your campus and you may see your story in print.